Field Notes: Happy Spring Equinox! The valley is looking so lush and refreshed now that the rains have slowed down and the weather is warmer. Red bud is in full magenta bloom, the wildflowers in the hills are prolific, and the oak leaves are starting to emerge. Asparagus harvest began in earnest last week so asparagus bunches should appear in your veggie boxes steadily for the next few weeks. Now that the fields are dryer, we’ve been transplanting kale, chard, fennel, and lettuce every day along with direct seeding beets, turnips, carrots, and spinach. Looking forward to a long springtime. The tomato starts will be transplanted in mid to late April. Spring Hams: Please place your orders for spring hams by 9:00 am Monday April 10, 2017 to ensure delivery by the holiday. We have a limited supply of hams so it’s best to place your order early. The weight range is 3-7 lbs per ham. The price is $10 per lb. The Riverdog Farm hams are smoked and cured (pre-cooked) at Roundman’s in Ft. Bragg. They are delivered frozen to your CSA delivery site. Glaze the top with orange marmalade, place in a casserole dish in 2-4 cups of orange juice and cover loosely with foil to hold in the moisture. Stick a few cloves in the ham for added spice. New Pastured Pork Sausage Varieties: Bacon Sausage (smaller links, 5-6 per package), Andouille Sausage (2 big links per package), and Country Sausage (smaller links, 5-6 per package) $100 for a 10 lb case. These fresh sausages (not pre-cooked) are made at Roundman’s Smokehouse in Ft. Bragg with our pastured pork. We hope you give them a taste! Pork Bone Broth: New in 2017!! We are pleased to offer our pork bone broth made from Riverdog Farm pastured pork bones and our certified organic carrots. Roliroti in Oakland makes the broth for us in their USDA certified kitchen. They roast the bones and carrots then cook them in water and strain the liquid broth into the 32-ounce jugs. We deliver the broth frozen to your delivery site. 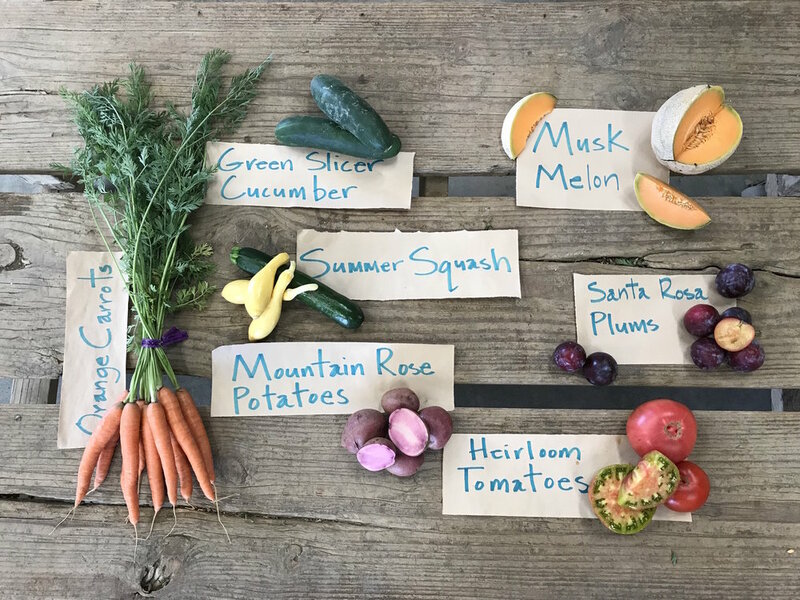 Please contact the farm at csa@riverdogfarm.com for pricing and to place your order. The meat orders are delivered to CSA sites frozen in a strapped cooler. The farm retrieves the empty coolers from the CSA site the week after delivery. Please take your meat order out of the cooler the day of delivery or return the cooler the following week to the CSA delivery site. Riverdog Farm hogs and chickens are certified organic animals raised on diets of certified organic corn/soy/triticale, produce culls, alfalfa, rye grass, clover, Three Twins Ice Cream overruns, and whey from Cowgirl Creamery. The meat is not labeled organic because the processing facilities are not yet certified organic. We are working with our processors to have the facilities become certified organic so that we can label the packaged meat as certified organic.